Have you ever looked at a map and noticed that you could draw quite a long straight line joining up churches and even a cathedral along its length? The talk by Peter Gibson, our Vice Chairman, on 28th August, provided the answer. These are ley lines or, as they should more properly be called, leys. Peter began by defining leys as track ways made by ancient man as he crossed the country for trade. To dowsers, they manifest as an alignment of sacred or secular lines in the landscape and can include fords and bridges, wells and ponds, the summit of hills, straight lanes and roads, castles, tumuli and long barrows from prehistoric times. 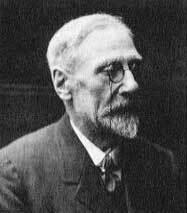 Dowser and author Alfred Watkins (1855-1935) from Hereford, first coined the phrase after he saw that the countryside over which he had walked for many years, showed alignments with such frequency they could not be coincidental. So he dowsed and searched and came across old paved tracks, existing roads and sighting points such as stones and mounds. He called these alignments ‘leys’ and his book ‘The Old Straight Track’, published in 1925, is still the standard reference on the subject today. To qualify as a ley there needs to be a minimum of five such features along a straight 25-mile line. Ley is an Anglo-Saxon word meaning pasture or clearing in the forest and is incorporated in many place names, notably Dursley, Uley and Coaley. It’s human nature to take the shortest route, and it was easiest for early man to journey in a straight line. He would choose a landmark such as the top of a hill or other prominent feature in the landscape, and go for it. On the way he would need to find water, and a safe place to rest. Place names can often give an indication of the trade conducted there. Salt has always been a necessity and leys would often pass through towns and villages such as Saltash, Whiteways, Whitsands and Wick. Similarly, Chip or variations thereof, i.e. Chippenham, indicate where flint tools were made by chipping away at pieces of flint. 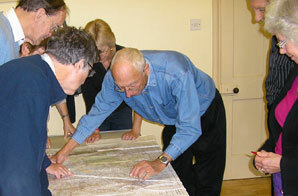 Examining maps and looking at place names can give the first indication of where a ley might be found. 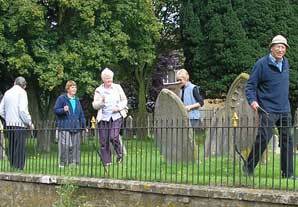 Peter continued his talk by showing examples of where he had discovered leys in different parts of the country. Of particular interest was Tumpy Green Farm, (meaning a tump in a high place) where he traced an alignment from their garden (where dowsing indicates there was once a hospice and religious house), to Slimbridge Church, on to Hardwick and Quedgley, passing through Gloucester Cathedral and thence on to Leigh and beyond. In the opposite direction, the ley led to the church at Stone and beyond. We were able to follow this ley on the local OS map using rulers and a length of string. To round off Peter’s talk in Slimbridge Village Hall, the group went across the road to Slimbridge Church to dowse for any leys there. They were successful in finding two leys that ran right through the church, indicating how important the site was to early man, even before the present church was built in the 13th Century. Chapter 1 of The New Ley Hunter's Guide by Paul Devereux can be found online and gives a good account of the work of Alfred Watkins and how he developed his theories.